The news broke last week, 4th of January that the 2016 national budget presented by President Muhammadu Buhari to the National Assembly for ratification had been withdrawn by the president for possible adjustments. According to the report, the withdrawal was secretly done on the 22nd of December, 2015. With the intensity of criticisms that trailed the budget, Nigerians needed no soothsayer to confirm a withdrawal was imminent. The obvious was later confirmed by the Majority Leader representing Borno state, Ali Ndume on Wednesday, 11th of January; that the budget was missing during a closed-door session with other lawmakers. The All Progressives Congress has a record of a barrage of lies and failed promises ranging from the denied plan to reduce price of petrol to N40 per litre, 3 million jobs for yearly for the youths, equation of the value of Naira with the Dollar, N5000 palliatives for the unemployed, technical defeat against Boko Haram, sectional anti-corruption war among others and to cap it all, the disgraceful disappearance of documents as vital as a country's budget from the senate with nobody taking responsibility. Nigerians are not as foolish as the leaders think. It should be noted that there are constitutional means of applying for the withdrawal of the budget by the presidency from the National Assembly. I see a government trying hard to cover its mistakes at all costs. 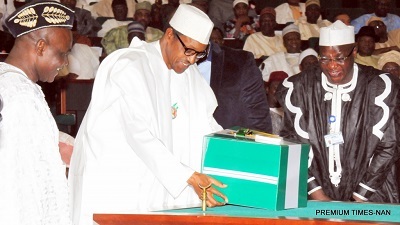 A document as important as the national budget of a country which will guide the performance of the heavily hyped Buhari's administration in the year 2016 was assumably prepared under a period of 6 weeks as a result of Buhari's lateness to appoint members of his cabinet which he did on the 11th of November, 2015 virtually 5 months after his inauguration. It is safe to admit the budget was produced through the approval of the Ministry of Budget and Planning which is headed by Senator Udo Udoma. The national income in the budget was planned around the sale of crude oil for $38 dollars per barrel while the price has dropped below $35. This is a gamble due to the prediction by the International Monetary Fund, IMF that the price of oil will experience a massive free fall that may see it as low as $20 dollars in the nearest future. The N29 billion allocated to the agricultural sector compared to other massive allocations to other ministries that commanded a higher allocation reveals Buhari's stand on the development of agriculture despite his public statements about using the agricultural sector to create jobs for the teaming youths. What about the N3.6 billion vote for unspecified number of BMW saloon cars for principal officers? N362 million allocations for Wildlife preservation, N189.1 for the purchase of car tyres for the presidency amongst several others are depicting wastage of state resources. If the reports of online news platform, SaharaReporters are to go by, Buhari withdrew the budget from the Senate to adjust the loopholes in it which were heavily criticised by political and economic analysts. Saraki boldly covered up for Buhari to impress him and expect a returned favour in the quashing of his case at the Code of Conduct Tribunal over a 13-count charge bordering on a false declaration of assets which was reportedly politically masterminded. This is reasonable enough as the national budget is worthless to any lawmaker or private individual. Our public office holders may not be trusted with funds but documents are safe with them historically speaking. The alleged theft of the hard copies of the 2016 national budget hitting the headlines is no doubt a national disgrace. A country that can't secure rare documents as important as its budget at the senate level may not be trusted with the lives of over 170 million people. This may seem as a fallacy of hasty conclusion and unwarranted assumption but it’s just a simple logic. The principle of responsibility and accountability in Nigeria on the part of public office holders is long dead and buried. The budget could have been covertly adjusted and for the reputation of the country among the members in the international community that are constantly gathering intelligence about other political actors in the ecosystem, the action could have been hidden. But the People's Democratic Party lawmakers celebrated it as if they just hit a milestone. One of the media representatives of the PDP, Deji Adeyanju was on Twitter making unguarded statements uncontrolled all through the night of the 12th of January when the case gained strong pronouncement. There is a major problem of loyalty in this country and political parties are regarded as greater than the country itself which is an anomaly. As a seasoned journalist, I am of the opinion that the news of the dramatic disappearance of the budget is not for public consumption. It only led to comical memes on the social media. (5) Is Buhari listening to his ministers? Nigerian Pastor and political analyst, Femi Aribisala has heavily criticised Buhari for castigating his ministers which I felt assumed was another unfounded claim by a critic. The loopholes of the national budget with culminated in an embarrassing alleged withdrawal shows a frosty relationship between the president and his cabinet members. I don't want to believe the excesses of the budget like the N1.75 billion allocated for food for Aso Rock for the year 2016 which is over a 100% increase compared to the budget of former President Goodluck Ebele Jonathan on the same issue in 2015 which amounted to N530 million among others is that elusive to the great heads we have in the Federal Executive Council. It would be recalled that Jonathan was nailed for by the opposition when the Aso Rock Villa food allocation stood at N1 billion in 2011. One wonders why the APC that represents 'change' is making the same mistake at even a costly hour. This is happening when the economy is dwindling and the budget will be sustained on massive borrowing of N1.88 trillion which spells doom on our debt profile which already stands at $60 billion. How can Buhari explain the essence of the N39 billion allocated to the Ministry of Information and Culture of Alhaji Lai Mohammed? Are 'lies' that expensive to peddle? Buhari might be an anti-corruption specialist but with his response to economic issues at the maiden edition of the presidential media chat, he is far from it on economical analysis which is pardonable. In conclusion, this shows someone wasn't consulting or listening to his cabinet if truly the president withdrew the budget as media giant, Premium Times insinuated. A lot of readers will wonder why I am dragging the Information Minister into this issue but you will agree with me that part of the responsibilities of that office he occupies is to intimate the Nigerian people about the truth behind controversial issues like this to prevent them from being misled by propagandists. This may cause them to lose faith in the current administration. It would be recalled that when the biting crisis of fuel scarcity gradually started in November, 2015 from the Eastern part of Nigeria, Lai Mohammed was purposely quiet for over two weeks. What about the case of the missing 105 Nigerian soldiers fighting Boko Haram in the North-east? He kept mum and let critics like Femi Fani Kayode, PDP chieftain to have a field day with the rumours. Again, on the issues of the missing 2016 National Budget that has led to insinuations that Buhari submitted an empty box to the National Assembly by the PDP media aide Deji Adeyanju which he claims about 22 PDP senators confirmed, Lai Mohammed is unusually ‘observing’. This is really sad. Nigerians need answers. We need an Information Minister that can carry us along and clear the air on controversial issues like this before degrading assumptions are made on the social media which has become too powerful and relevant in Nigerian politics.